In dressage double bridles have come to be considered as an essential piece of equipment, indeed it is compulsory at all higher levels of competition, but is it really a necessary part of correct training? The Effect of the Dressage Double Bridle: A True Refinement of the Aids? So in terms of the force that the double bridle is capable of exerting on the horse's mouth, why would it be considered as a refinement? When a sculptor carves a statue from a block of stone, his tools become less powerful the more the sculpture is refined, after all you do not need a heavy-duty tool to perform a delicate gesture. Dressage horses are supposed to become more sensitive to the aids the more they are trained, so the effect of the bit should become less and less important, not more so. The Real Question: How Is The Rider Controlling The Horse? If the power of the bit needs to be increased along with the difficulty of the work that the dressage horse is being asked to perform, it is clear that the bit is playing an important role in the overall control of the horse. This is, unfortunately, the unspoken reality of a great deal of dressage riding. 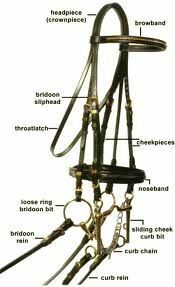 The dressage double bridle is used as a way of blocking the forward impetus of the horse so that the rider can create an artificial form of collection. Power is generated from the hind-end (often by over-use of the spur) which instead of being contained by the horse's postural engagement as it should be, is contained by the rider's hold on the horse's mouth via the bit. In this way of riding, the more power that is demanded from the horse in order to perform advanced movements, the more power is necessary in the bit to control it. You only need to look at the angle of the curb bit shanks in the mouths of the majority of horses competing in dressage in double bridles (including at the highest level, as these extreme examples show) to see that there is in fact no 'refinement' going on here. 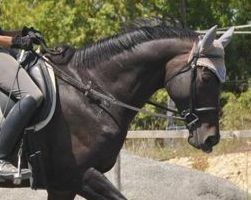 It is not a rare thing to see a dressage double bridle with the curb shank pulled horizontal to the ground by top level dressage riders (during tests as well as controversial 'warming up' practices) indicating a massive pressure on the horses mouth, jaw (via the curb chain) and poll. This in turn usually obliges a heavy use of spurs to maintain the forward movement of the horse sent into this barrier. If you imagine yourself as a horse trapped between these two pressures, it gives an idea of just how tolerant of abuse many horses are. 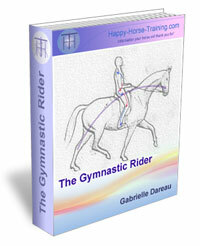 When the rider engages the horse correctly the energy generated form the hind-legs is channelled into the longitudinal stretch, and this power is simultaneously contained by the engagement of the ring of postural muscles which re-balance the horse over the flexing hind-legs very much like a spring being compressed. Therefore, the energy coming from behind is controlled before it ever reaches the bit, increasingly so the higher the level of training, which means there is more and more self-carriage (as shown in this photo), and the riders control of the horse via the bit becomes less and less significant. The highly engaged horse becomes increasingly unified with the rider's posture, and therefore more and more responsive to the signals of the rider's body, requiring less not more aiding from the bit. This approach is based on the fundamental premise that the horse's head-carriage is dictated entirely by the level of engagement of the haunches, and that the rider therefore has no need to ever attempt to 'place' the horse's neck in a certain outline, no matter what the level of training (this photo, right, shows a dressage horse clearly held up into a so-called advanced head carriage with the double bridle bits). It also assumes that collection is always achieved by the rider's seat, along with the necessary straightening of the horse. Using the bit to collect a horse is like only using the front brakes to slow down a lorry with a heavy load - the centre of gravity is projected forwards - the opposite of the true goal of collection! In this picture the collection that is being achieved (which, incidentally, does not come at all easily to this horse!) 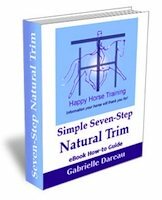 is not anything to do with a holding rein, since the rein is clearly slack, it is being created by the riders seat and postural leverage, along with the straightening aids. The real effect of the double bridle on the horse in fact has nothing to do with a refinement of the aids, although it may feel like this to the uneducated rider. In fact, the double bridle makes the horse soften, or release, its jaw in a similar way as the horse does when he comes on the bit correctly, but in the case of the double bridle, it is an isolated softening coming from the horse's desire to escape the immense pressure (or the even the threat of it) from the bit. This has nothing to do with the true softening of the jaw when the horse engages, which happens as a result of the engagement of the ring of postural muscles in the horse's whole body. The artificial release in the horse's jaw created by the use of the dressage double bridle will make the horse round up his neck and lift his shoulders in apparently the same way as when the horse comes on the bit correctly, but it is a complete dead-end in training terms because it has no beneficial effect on the way the horse is carrying and using his body. For the rider, the effect of the dressage double bridle is actually very misleading, precisely because it creates this false softening to the bit, which is normally one of the main indications to the rider that engagement is taking place. With the effect of the double bridle, this orientation is lost and as a rider, you no longer know where you are with your horse. This was made very clear to me when, as a young rider during a period as a working pupil, my dressage trainer instructed me to ride my horse alternately one day in a double bridle, one day in the snaffle. The horse was an arab mare, not at all disposed to coming on the bit(! ), and at the time I was posturally weak, and lacking the understanding of how to use my seat correctly to bring about engagement. The difference in my arab mare on the days when I rode her in the double bridle was dramatic. On those days she rounded up, felt soft and light in her mouth, and all the resistance she normally presented to my aids seemed to magically disappear. However when I went back to the snaffle bridle, everything was back to square one - with her resisting my attempts to put her on the bit. Although I wasn't experienced enough to really recognize it at the time, all of the work she did in the double bridle was of course completely false. Blocking her in this way in front and then asking her to perform figures, transitions, lateral work and so on, was actually, over time, causing her to stiffen up up in her neck, back and hind-legs (to my dismay, my sister pointed this out to me when she saw her working again!). Incidentally, I never used the double bridle strongly in comparison to the way many dressage riders do, but it was still enough to have the false jaw-release, head-tucking-in effect that covered up the lack of genuine engagement, and stopped me having to do something about it with my own posture. 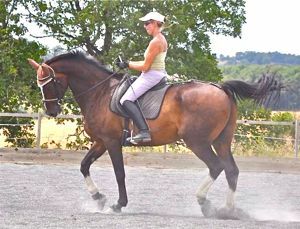 It is true that personally we do not impose the restrictions of working towards competitive performance on our dressage training, but we do make the quality of the engagement of our horses when they work our top priority, and we have never got to the point in training where we in any way felt the use of a double bridle would help this. We find that the only requirement for the bits we use is that they are comfortable enough in the horses' mouths to facilitate the development of a correct forwards-stretching, elastic contact which is created by the right seat, posture and aiding. 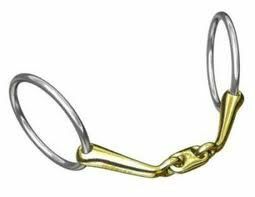 For this, we find that a variation on a simple lozenge snaffle (such as this one) depending on the individual mouth is entirely adequate. Of course this is not to suggest that you can't hold onto your horse's mouth just as much with a snaffle bit, but at least you will be directly aware of the pressure you are exerting on the horse, and the horse stands more of a chance of resisting against it to protect himself. Although it seems like a laughable proposition, I personally feel that if, in competitive dressage, double bridles were disallowed, it would be to the great benefit of good dressage training and riding that is based on the genuine engagement of the horse.